Just a week before leaving to Greenland, my brother said, "Hey, could I go?" Andy had done two previous climbs in his life. Both were first ascents, one in China and one in Kyrgyzstan, both with me, though over 10 years ago. On both, he followed me on jumars. He would need to relearn everything. I said to him, "Dude, yes, let's do this! Let the joy and bond, belief and blood of brothers begin!" I'd flown the same route from Iceland to Greenland seven times since 1998, and I had never seen so much sea ice clogging the coast from the airplane. It was like a million-piece puzzle of white geometric shapes. 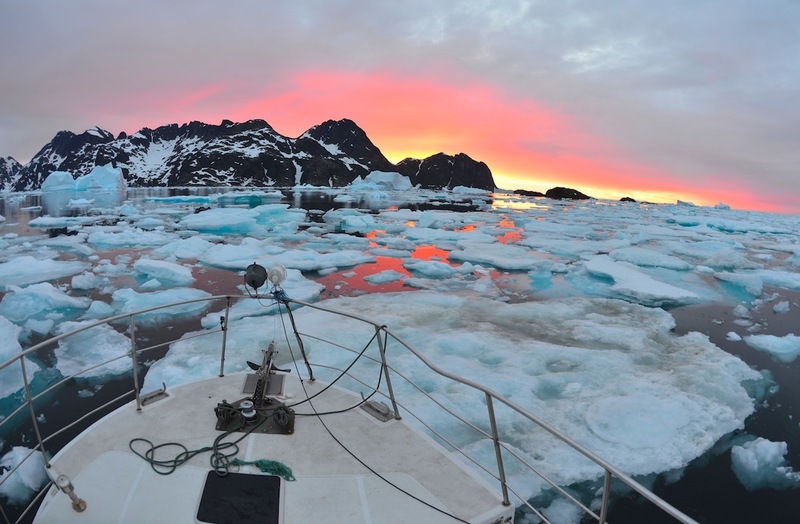 Once we landed in Greenland, we were scheduled to travel nearly 400 miles by boat through this impossible maze of ice to reach a remote fjord with Siggi Sigurdsson, the most experienced boat captain in the area. His vessel was one of the most Arctic-ready boats around. But Siggi had gotten stuck in sea ice while navigating his 40-foot boat back to Tasiilaq from Iceland. With his wife and kids on board, Siggi spent more than a week trying to find a passage. No one had heard from him for several days when we got to Greenland. The next day Siggi finally contacted the local authorities and said he would find a way through if it took him two weeks. Five days went by, then we got an update: Siggi's boat was taking on water and a rescue had been called in. A helicopter hoisted Siggi and his family to safety, and his boat was left to drift and eventually sank. Fortunately, everyone was safe. This photo was taken on the deck of Siggi's boat before it sank. Eventually Andy and I were able to reach our destination when we met Bendt Josvassen and his wife, who were willing to attempt the journey along with some friends who had another boat, which was needed to carry fuel for the first boat. We had found boats to take us to the fjord that would allow access to Polar Bear Fang, but sea ice kept the mission in doubt right to the end of the journey. In the end, Bendt Josvassen had to ram his boat through the ice to enter the fjord. Once we were in, the Polar Bear Fang Tower was just around the corner. It was close to 1 a.m., and the sun was hiding behind the massive mountains that surrounded us. Andy and I grabbed some bivy gear and fourth-classed to a ledge high on the cliffs near shore to sleep, safely away from bears. 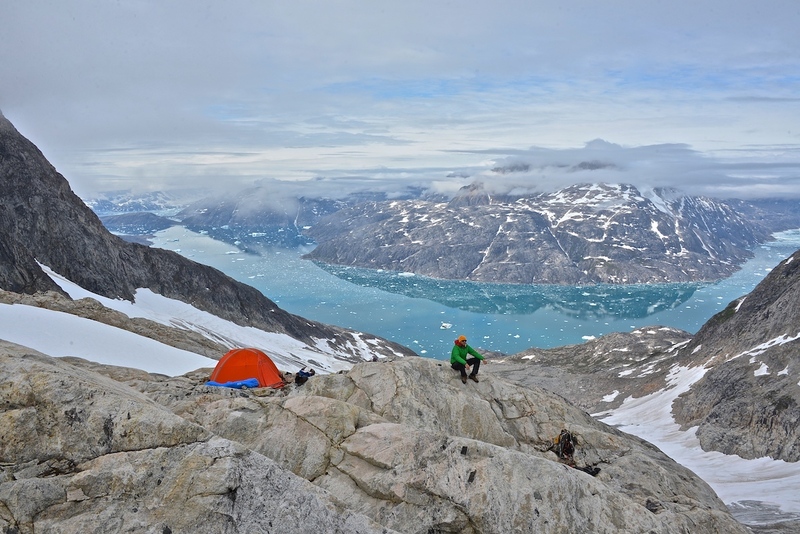 After a few days, a few dozen miles of hiking, and several roped-up glacier crossings, we came to a beautiful granite ridge surrounded by glaciers, about 900 meters above the ocean and our base camp. 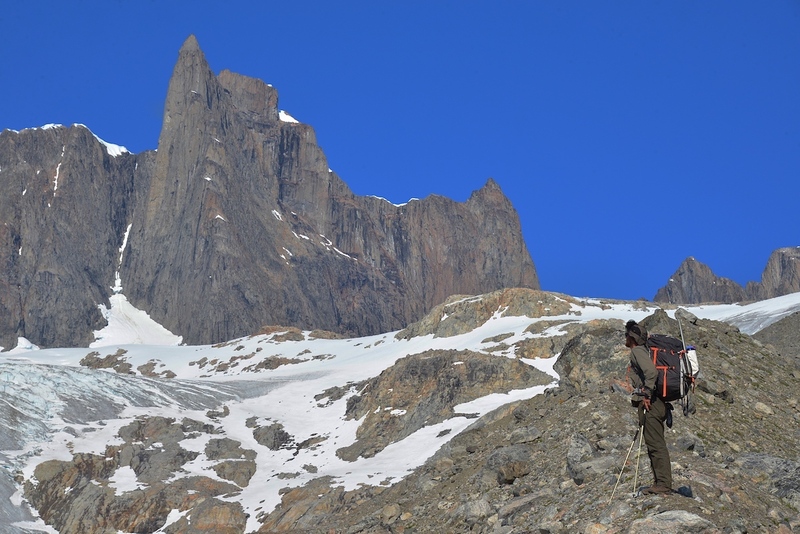 We had carried enough supplies to stay up at our high camp for at least 12 days. In this photo Andy approaches the Fang, which was still a few miles away. There was a false ridge to a huge valley that added another 1,000 feet of climbing that we couldn't see. This photo shows Andy at high camp just before a snowstorm hit. By then we'd scouted the approach and potential routes. I was less than a mile from the tower I'd been trying to reach for more than a decade! We racked up and headed to the base of the tower after the storm, bivying there before starting the climb. I decided to bring the satellite phone—the first time I'd ever brought one on a wall—so that Andy would have some kind of fighting chance if something happened to me up there. I planned to free climb the entire route with Andy following on jumars. Before we got in our bivy sacs, I fixed a pitch and had him clean it for a quick refresher. He cleaned the pitch with ease. We left our stove and took only energy bars, gels and chews, and three liters of water. I led with two ropes and a double rack of cams and nuts, a few hexes, a hammer, six pitons, four bird beaks, and two alpine aiders. Andy would follow me with the pack, the food, bivy sacks, sat phone, Year of the Ram masks, approach shoes, a small bolt kit for emergencies, headlamps, rain jackets, and light down jackets. We each had a two-way radio clipped to our harness. We started in light fog and clouds. By the third pitch, I'd already been forced off my planned route to avoid huge, hanging daggers of rock. We ended up veering way left, but the fun 5.10 pitches delighted me, with good pro and natural anchors at the end of 60-meter pitches. Considering my brother would be jugging on a rope amid lots of loose rock, with little experience, I really focused on how the rope would run, placing extra gear for directionals. I used up a few extra hours focusing on this so that he wouldn't pull loose rock on top of him, and the potential was huge. After two shiver-bivies I knew we were getting near the top, because we were above every other summit I could see. The crux of the route came two pitches before the top: a huge chimney filled with loose flakes and rotten stone teeth. When I finished the pitch, I radioed to Andy, "Hey man, belay is off, and please, please go really slow, be careful what you touch, focus man, no mistakes." Just inches from my anchor were big teetering fingers of stone I did not want to touch. We finessed through it and then climbed an overhanging bomb-bay chimney—one of the coolest 5.8 pitches ever. 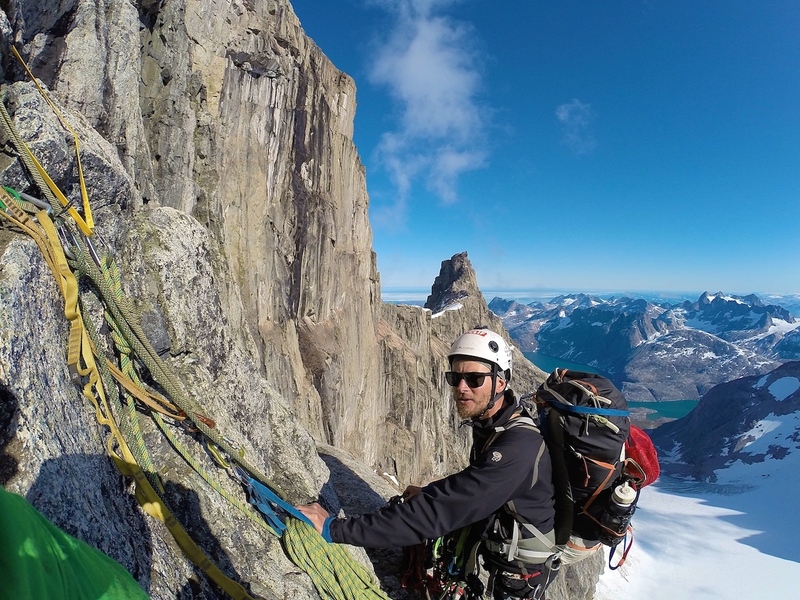 The last technical pitch was a full 60 meters of clean 5.9 granite that took me to within 20 meters of the true summit. To the west, I noticed a storm system headed our way. The summit celebration would have to wait. It took us half an hour to craft a small bivy, pictured here, just ten feet from the summit. We coiled our ropes into mattresses, put everything on and waited for the shiver fest. The storm ended up missing us and we laughed in our bivies. 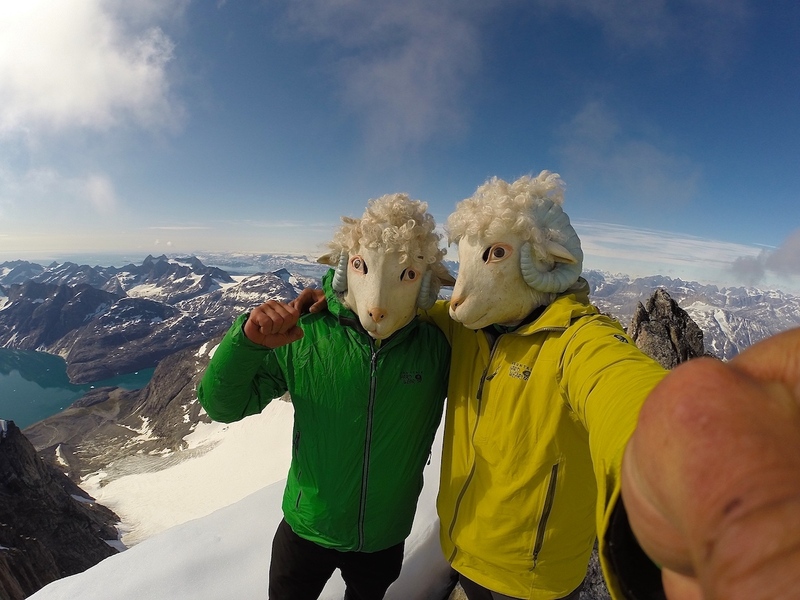 The next day we crawled out of our frozen bivy sacks and celebrated the summit, donning Year of the Ram masks. On my watch the elevation read 2,030 meters. We were on the highest point as far as we could see, nearly 400 miles from the nearest civilization. It was a glorious moment, not only because of the years trying to be in this exact moment and place, but also to be here with my brother. We had a dangerous, unknown descent ahead of us but we enjoyed the moment. The descent ended up being one of the scariest of my life. 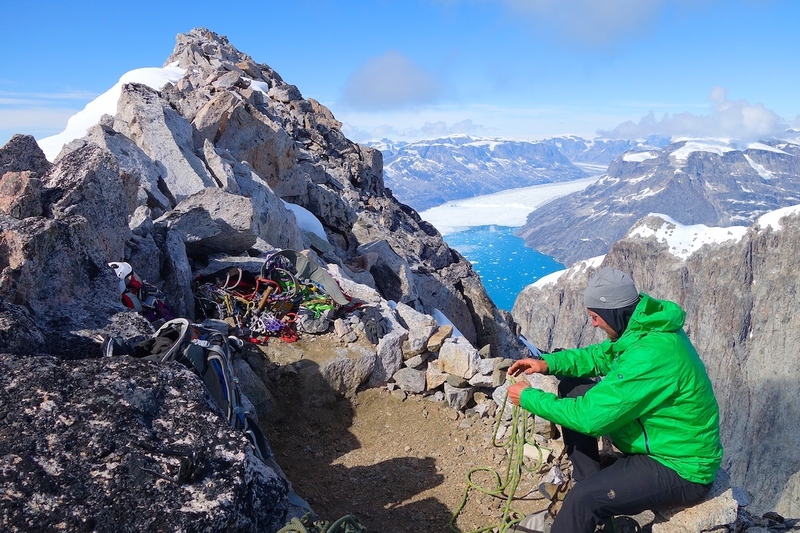 The route we climbed was incredibly friable, so I decided to rappel off the opposite side and try to reach a gully, then find our way down to a big glacier that was tiger-striped with crevasses. After six rappels, we gained a ridge on the backside and traversed to a huge ice gully. I staggered the anchors, with each pull of the ropes, loose rock followed. After seven more rappels, at the bottom of the gully, we had to Tarzan-rope-swing over a huge mote-gap to get on the glacier. We both stayed clipped into the bottom of the ropes in case we were on a big crevasse roof. We did not have crampons or ice axes with us, so I decided to do what the polar bears do. We crawled back instead of trying to walk with packs, our legs acting as puncturing tools into crevasse bridges. We stuffed gear into our bivy sacks and used them as sleds as we crawled, equalizing our weight on hands and knees, ropes tied between us as the full moon came out. We crawled for half a mile back to our high camp. We laughed just like we did our whole lives together. 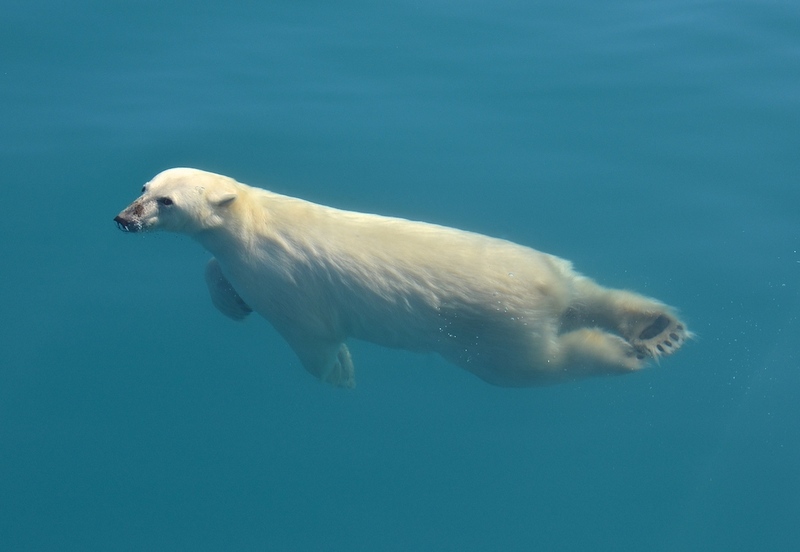 When the boat finally picked us up, we watched a huge polar bear swimming towards our base camp.